I guess I was spoiled since my mom bought fresh ingredients almost daily at a local farmers' market. My mom didn't know much about nutrition, neither did my grandparents, but we ate unprocessed food, mostly vegetables, and little sweets. My grandparents never took vitamins, ate a balanced diet and lived a healthy life. My maternal grandmother lived to be 93 despite her emphysema, caused by her smoking, the only bad habit she had. Few years ago I had a food epiphany when I went to my garden, picked some snap peas that I quickly sauteed with spring onions and some parsley, also homegrown, and proceeded to toss some pasts with them, it was the best pasta sauce I ever had, the peas were so tender and full of flavor. 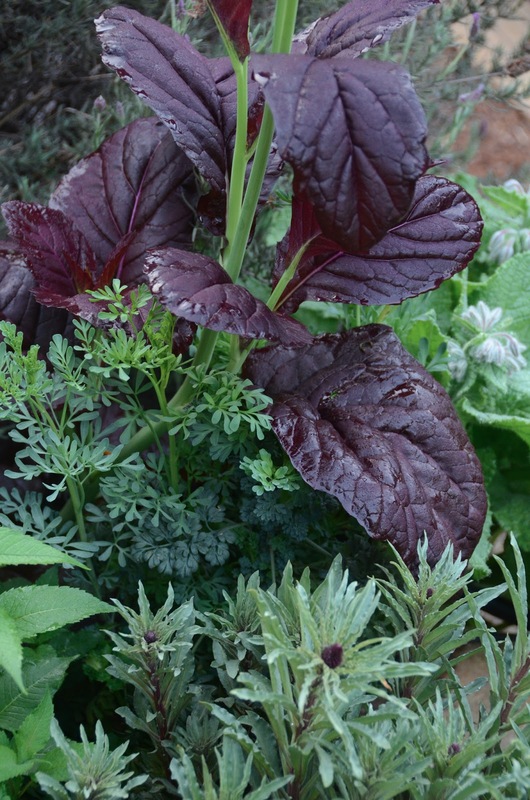 As soon as a plant is picked it starts losing nutrients so if you can grow your own, do it, even if you don't strictly have a vegetable garden, many edibles can be inter-planted with ornamental plants for stunning combinations. Kale, or Brassica oleracea, belongs to the cruciferae or brassicaceae family, together with cabbage, brussel sprouts, and cauliflower. There are few kale varieties, Lacinato or Tuscan kale, the main ingredient of the Ribollita soup, might be the best known, but other beautiful varieties are Red Russian, Curly, and Redbor. Kale is a heavy feeder so it needs good draining soil with plenty of organic matter. Kale is a biannual plant, it can be seeded in late summer/early fall or early spring, and it will bloom and die the second year. 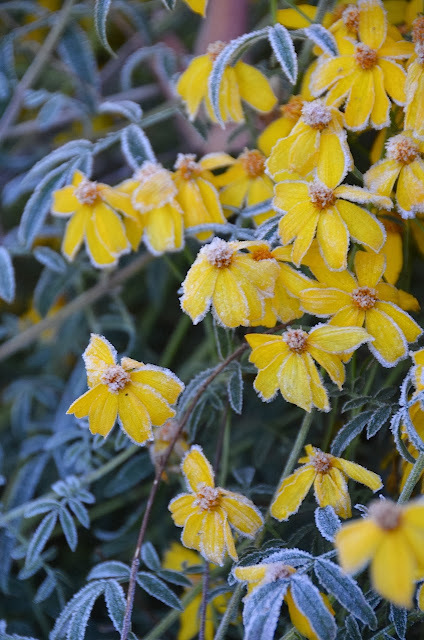 Kale will cross pollinate with other varieties so if you want to collect true seeds for next year harvest, you need to either self pollinate and cover the flowers or keep only one kale variety. Kale plants love to be munched by slugs and snails, and the little seedlings may have to be protected by hungry birds. Aphids starts attacking kale in the spring, but they can be kept under control by beneficial insects. 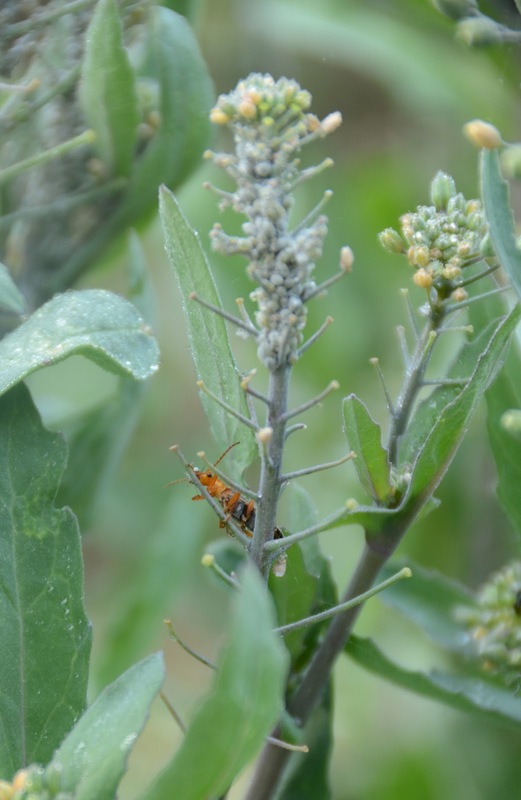 One time I left an aphid infested plant up as food for the beneficial insects that came in droves, such as the soldier beetle below. Kale’s health benefits are due to the high concentration of antioxidant and vitamins A, C, and K. Kale also contains lots of fibers, calcium, vitamin B6, and magnesium. 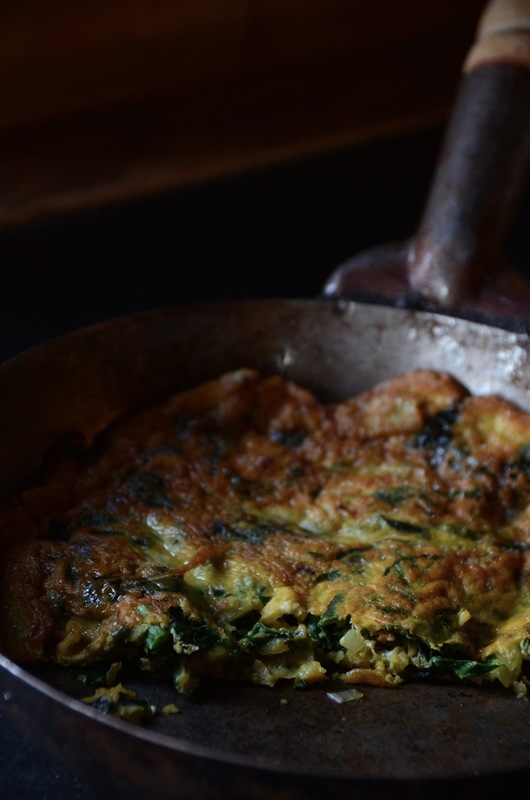 Click here for a tasty kale frittata recipe. Early bloomers for Northern California. Part of being a good land steward is to avoid the use of any pesticide and instead rely on natural methods of pest control. I haven't used any insecticides in my garden, it doesn't mean I have no pests but I am able to keep them under control with various methods. Healthy plants that are more resistant to pests are made by healthy soil so I keep the soil fertile with the addition of homemade compost, I also inter-plant edibles with flowers that attract beneficial insects, a plus is that the garden looks so pretty with all those early flowers. Most insects, good and bad, overwinter only to reemerge in the spring. To provide nectar for the hungry pest predators I have added many early blooming plants. Some were bought, some reseed themselves, some are perennials. In my post on beneficials I mentioned few plants that bloom in mid spring, but the ones mentioned below have been blooming for few weeks already. Just to name few plants blooming in my garden now: Borage, Borago officinalis, a self seeding edible annual, Biokovo Cranesbill, Geranium x cartabrigienses "Biokovo", a spreading groundcover that loves shade and blooms profusely, Juniper's beard, Centranthus ruber, another self seeding perennial plant, and Sweet alyssum, Lobularia maritima, which I bought since I don't have a greenhouse to propagate it. 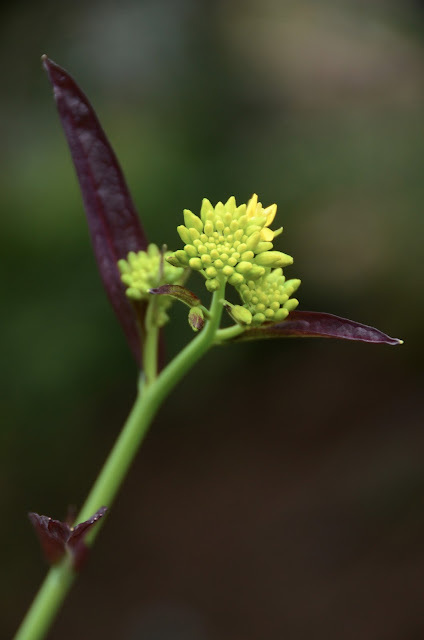 I bought Blue hoenywort this year because it is beautiful and it a self seeding plant. It belongs with Borage to the Boraginaceae family, both plants are loved by bees, which are already showing up in my garden. Above are few perennial plants that will soon bloom and look so pretty together. Anche l'occhio vuole la sua parte, even the eyes wants its part, we have to satisfy our sense of aesthetics, we say in Italian. Last year I planted red giant mustard, soon to discover that its flavor is too strong for me. I fell in love with the plant color however, and this year I used it as an accent in my veggie garden, and left the plants flower for the tiny predator wasp, who seems to like this type of flowers. The color combination is stunning. 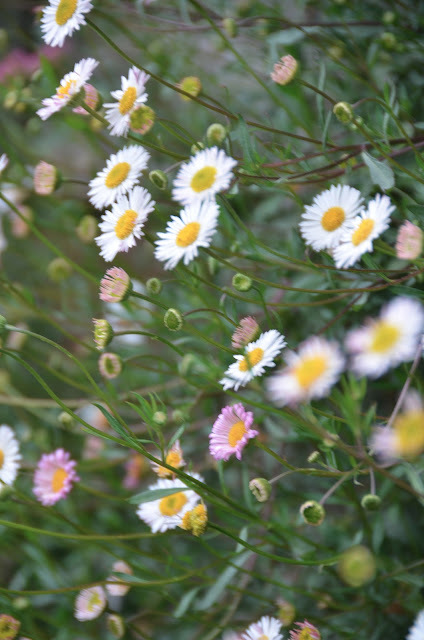 Mexican daisy, Erigeron karvinskianus, such a pretty and prolific bloomer. 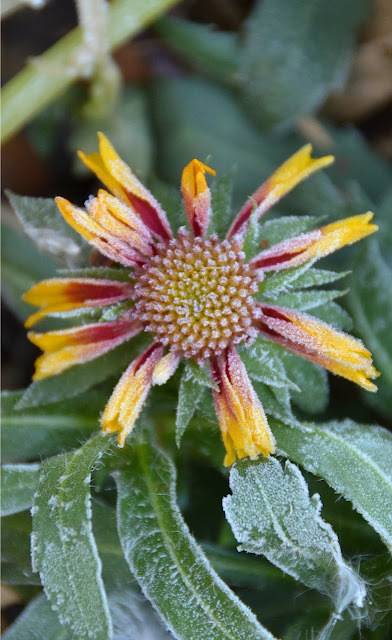 Mexican daisy can self sow vigorously but it is easily controlled and is such a pretty and easy plant to have in the garden. The plant above found its way in between the wood slabs of a tree planter. I keep cutting it back every year and it comes back better than before. 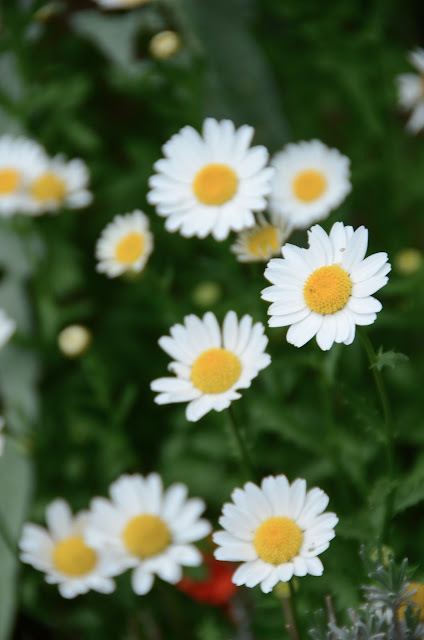 Feverfew is one of those super plants to have in the garden, not only for the beneficials but as the name implies for its medicinal value, looking at it makes me happy. I always knew that plants need good soil to thrive, I didn't know, however, how important the soil food web is in maintaining the health of plants until recently. 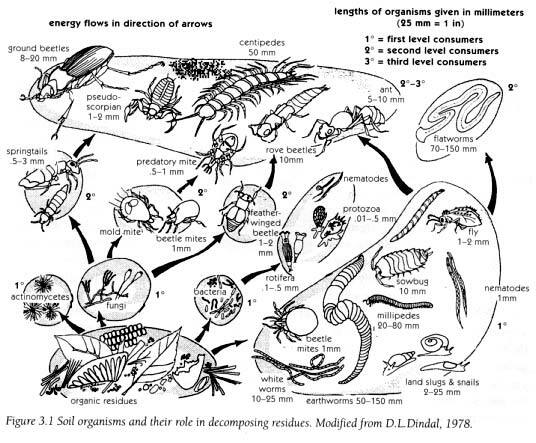 After I took a class on soil, and started reading more about this fascinating subject, I became convinced of the importance of the complex network of organisms found in soil. Do you know how many critters live in a teaspoon of soil...take a wild guess. There are over one billion bacteria, few yards of fungal hyphae, thousands protozoa, and few dozen nematodes in each teaspoon of healthy garden soil. They all contribute to the breakdown of organic material so that it becomes available to plants to absorb through their roots. Fungi eat bacteria, tiny mites eat fungi, earthworms eat mites, etc., they all produce waste, then die and return to dust, so the cycle continues. But what was discovered relatively recently makes it even more interesting; certain fungi create associations with plant roots and enhance their capability to absorb nutrients through their filaments, or hyphae. Moreover, plants produce chemicals called exudates, i.d. food, to keep the good microbes near their roots happy and thriving. Fungi also produce substances that inhibit other organisms from growing near roots, therefore defending plants from pathogen attacks. 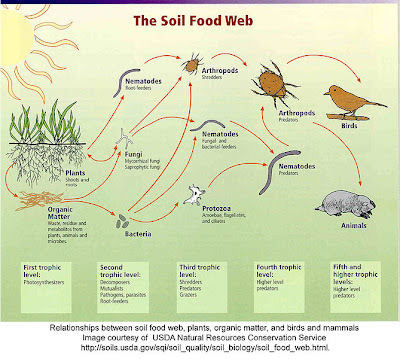 The soil food web is really important in controlling plant diseases. Certain fungi will predate on nematodes that would enter the plant roots and eventually kill the plant. Competition for nutrients in a healthy soil will also contribute to keep pathogens under control. When soil microorganisms are killed by non sustainable practices some pathogens will proliferate so the use of more pesticides is seen as necessary. Moreover the breakdown of organic material won't happen, so more synthetic fertilizers are applied and a vicious cycle will ensue. The good news is that soil has the amazing capability for recovery and it can happen within few years, depending on the amount of abuse a soil has taken. Synthetic fertilizers leach from the soil really quickly so it is necessary to apply more of them compared to organic fertilizers or compost, which break down more slowly. Not to mention that synthetic fertilizers are derived from petroleum, which there is less of it so their cost has been increasing in the last decade. Organic fertilizers' price has not increased at the same rate on the other hand. Another positive effect the soil web has is on the soil structure. The soil microorganisms produce excretions to move around or create aggregates to live in, these secretions function as a soil glue keeping tiny soil particles bound together. Burrowing animals contribute by creating pathways that help soil oxygenation and water penetration, and they also spread the nutrients around. Thanks to growing knowledge on the soil microorganisms, and many scientific studies being conducted at various universities, a growing movement of no till methods to cultivate the soil has emerged in the last decade. The principle behind it is that if soil is mulched and plenty of organic material is added to it, the soil food web will take care of the rest, including keeping the soil nice and soft with the action of the many critter that inhabit it. Tilling disrupts the complex soil food web, by inverting the soil layers and exposing many microorganisms to the wrong conditions. 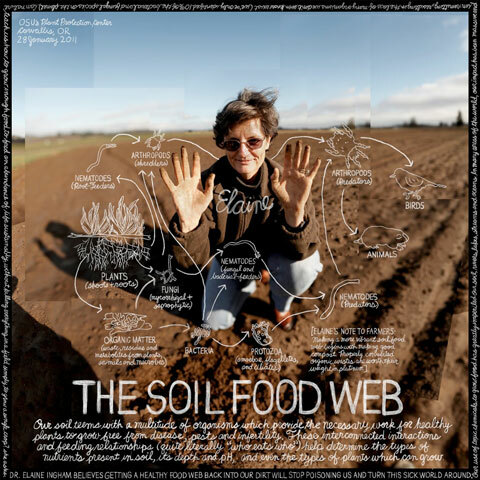 Elaine Ingham is a well known soil scientist and works at the Rodale Institute. She is a big proponent of the no till methods. Elaine is also doing great research on areated compost tea, which I find fascinating and it deserves a post on its own. For more reading about this subject, you can find a great description of soil microorganisms here, together with more articles on soil, at the Sustainable Agricultural Research and Education (SARE). 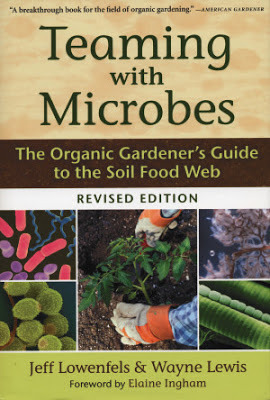 To learn more about this amazing system I highly suggest the book Teaming with Microbes, which gives a great overview on the soil food web, soil science, importance of mulching, restoration, and how to increase your soil fertility with home brewing compost tea. 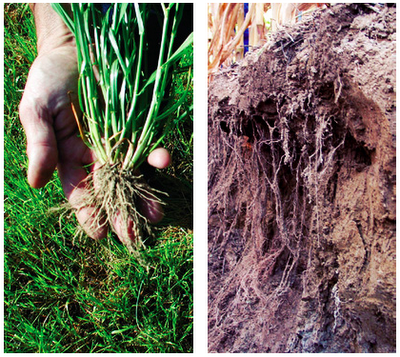 Another book worth reading is The Soul of Soil Building, a soil building guide. Roots Demystified is another great read on plant root systems. In other words: only fertilize with organic compost (best your own), don't till, protect the soil by adding mulch (I see another post coming on mulch), and if you are so inclined brew your own compost tea (it is cheap and quick). Now that you pulled all the summer veggies, and hopefully put them in your compost pile, it is time to think about feeding the soil. Your soil has been depleted by the fast growing summer vegetables and if you don't plan on growing any winter vegetables, instead of leaving your beds empty consider planting them with a cover crop. Cover crops or green manure are a fast and cheap way to add nitrogen and organic matter to your soil. Cover crops have been used for centuries to replenish the fertility of soil. If you want more information than I am providing here visit this great guide from Cornell University, which is targeted more to growers but has a nice extensive list of plants used as cover crops. Sadly it advises to kill the cover crops with an herbicide before tilling it in, wrong! 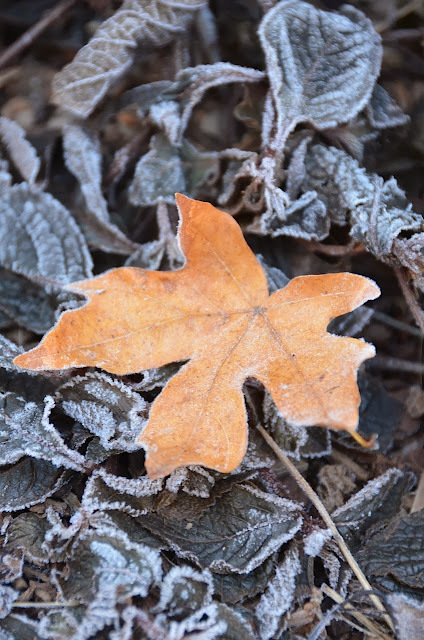 Winter or cool season cover crops are normally planted in the Fall, and albeit it is a little late for some cold winter regions, if you live in California you can still throw some seeds on the ground for a nice spring harvest. Cover crops can have three functions, enrich the soil of nitrogen, increase the biomass of organic matter in your soil, and when harvested they can be added to your compost pile to work as a green manure. There are two types of winter cover crop, the nitrogen fixing legumes, and the grasses like rye. Plants in the legume family add nitrogen to the soil through the actions of bacteria present in nodules on their roots. Without getting too technical, the bacteria absorb the nitrogen present in the air, in a gas form, and transform it or "fix" it into a form that is absorbed by plants. When the plant is harvested and the roots left in the soil, the nodules degrade and the fixed nitrogen is releases into the soil. Cool season legumes include clover, vetch, alfalfa, and fava beans. Grasses and grains build the soil and boost fertility by adding organic material and loosening hard soil with their long roots, they also suppress weeds and control erosion. Annual ryegrass, barley and oats are commonly used. Depending on your particular soil situation you can use one type of cover crop or a combination if you want your cover crop to accomplish more than one of the above. If you are unable to find cover crop seeds at some of your local nurseries you can find them online. Bountiful Gardens offers cover crop seeds in bulk, while Peaceful Valley Farm & Garden Supply has many soil building cover crop blends. 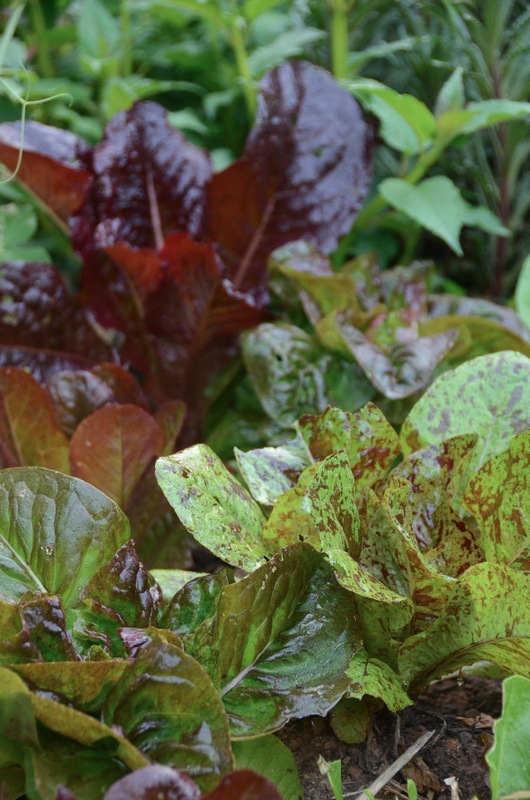 Once you have your seeds, remove and compost any debry of the spent summer vegetables. Loosen the soil with a spade, breaking any hard clumps, rake it smooth and spread the seeds according to the packet instruction (if you plant too many you can always thin them later). Gently rake the seeds into the soil and cover with some straw. Water well for the first week or so. Once the seedling emerge you can water less, or not at all if you have plenty of rain. 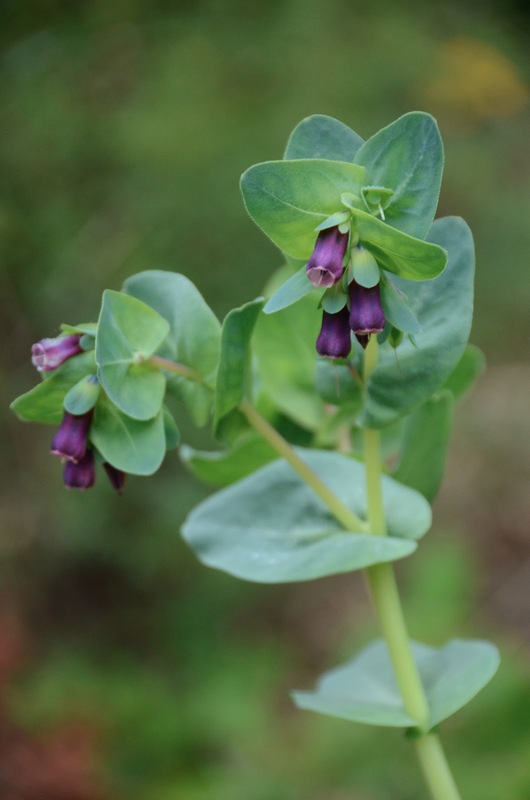 It is very important to harvest the legume plants right when they start flowering, which depends on the region you live in, it could be as early as February. Once the plant start flowering it starts using the nitrogen present in the nodules to produce its own seeds so for maximum nitrogen crop plants need to be cut down at the first blooming. Depending on how depleted your soil is you can either cut down the whole plant and till it in the soil, or cut and compost the green part and leave the roots to decompose in the soil. If you leave the whole plant in, cut it in smaller pieces, till it in the soil and cover it so the soil microorganisms will decompose it faster. In two or four weeks you can follow it with your spring planting. For grass crops the harvesting is less critical but plan on cutting the plants when they are six to eight inches tall and till them in at least a month before you plan on using the bed. If the grasses are left too long they get more woody and will take a longer time to decompose. I love the changing seasons. Coming from northern Italy I remember clearly when we started wearing sweaters, it felt good after the hot and humid Venetian summer. Where I live now we wear sweaters all year due to the fog, so I can't tell from the cold that the Fall is now on us. Many people think that there are no seasons in California, but it is so not true, my garden looks more and more brown everyday, and few annual plants stopped flowering in spots where the sun doesn't reach anymore. I started pulling some of the string bean plants and bought many winter veggie seedlings. Nothing says it more than Fall is here than the Japanese anemone, or Anemone hupehensis. After planting two plants I realized how invasive this plant is, but I decided to keep it because the flowers are so elegant and it eases the season transition with its beautiful flowers. One thing I will miss during the upcoming months are the flowers I can pick fresh from my garden. I am hoping for few more weeks of bloom and then it will be all over until March or April. By far the plant in my garden with the longest blooming is the Mexican Sage, or Salvia leucantha. The bees are still buzzing around it, and I expect at least another month or two of blooms. This plant can send underground runners too so it has to be kept in check every few years, however it has virtually no pests and it attracts insect pollinators and hummingbirds love it as well.